Ricky Stanzi loves America. Loves it. A profile of his red-white-and-blue heart dropped today, revealing how much he hates communists and hippies. Also in our inbox today: someone claiming to have a picture of Stanzi partaking of the hippie leaf. 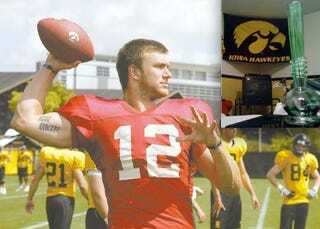 The (Cedar Rapids) Gazette tackles the Iowa quarterback and his patriotism, with some fairly revealing nuggets. 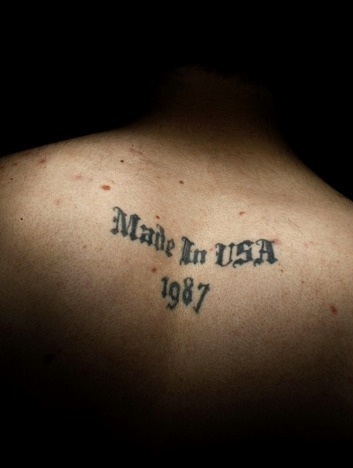 He's got "Made In USA 1987" tattooed on his back. Everyone in his family served in the military. He's got the Stars and Stripes on his house, and on his moped. He once yelled at a guy for talking during the National Anthem. And he can't stand all those burnouts and moon children and pinkos he's forced to see around campus. It's not cool - classes with a Communist. You get to college and this seems to be the most liberal place ever. I remember telling that to my dad and he said, that's just how colleges are. I don't know how other colleges are, but when you walk around here, you've got people...you've got guys walking around in dresses. I've seen hippies. They're doing nothing. There's the Ped Mall area down there. Right in the middle. Those people are going nowhere. Those people are the people who don't like America. They always find something wrong with it. They're the problem. They're the people who need to change and figure it out. Would you be interested in a very clear photo of Iowa QB Rick Stanzi smoking pot? It is from high school (he had it on his myspace page like an idiot) and I grabbed it in hopes of him becoming "famous" one day. Please keep my email and name anon.